Turn the a/c switch on. Operate the cooler compressor with an engine speed of approximately 1,000 rpm for 5 to 6 minutes to circulate the refrigerant and collect the compressor oil remaining in each component into the cooler compressor. Using sst, discharge the refrigerant gas. Perform vacuum purging using a vacuum pump. Do not operate the cooler compressor before charging refrigerant as the cooler compressor will not work properly without any refrigerant, and will overheat. Approximately 100 g (3.53 Oz.) 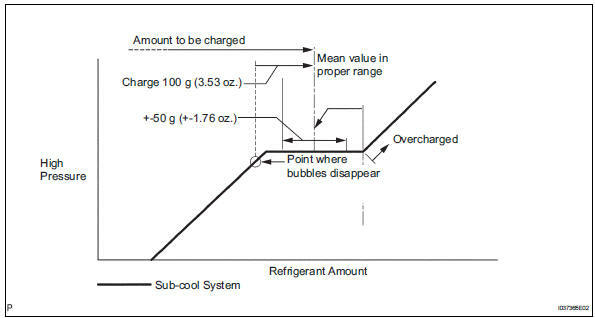 Of refrigerant may need to be charged after bubbles disappear. The refrigerant amount should be checked by measuring its quantity, and not with the sight glass. Warm up the engine at less than 1,850 rpm for 2 minutes or more after charging the refrigerant. Be sure to warm up the compressor when turning the a/c switch on after removing and installing the cooler refrigerant lines (including the compressor), to prevent damage to the compressor. 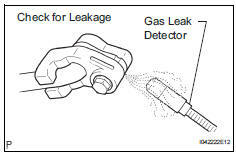 After recharging the refrigerant gas, check for refrigerant gas leakage using a halogen leak detector. secure good ventilation (the gas leak detector may react to volatile gases other than refrigerant, such as evaporated gasoline or exhaust gas). Repeat the test 2 or 3 times. Using a gas leak detector, check the refrigerant line for leakage. If a gas leak is not detected on the drain hose, remove the blower motor control (blower resistor) from the cooling unit. Insert the gas leak detector sensor into the unit and perform the test. Disconnect the connector and leave the pressure switch on for approximately 20 minutes. Bring the gas leak detector close to the pressure switch and perform the test.